Myth 1: Late-night snacking causes weight gain. Many people believe late-night snacking packs on extra pounds. The truth is, it’s not when we eat that matters, it’s what and how much. Our bodies need fuel throughout the day. If we skip meals during the day, that state of starvation triggers cravings at night, and we make up for it by overeating. To break the starving-binging cycle, go no more than four to five hours between meals, and watch your portion sizes. Myth 2: Following a vegetarian diet means limiting your choices. If you’re interested in a vegetarian diet, know that there are many types. Vegetarian diets range from those that eliminate meat, fish and poultry while allowing eggs and dairy, to those that avoid animal products entirely. If you plan a vegetarian diet carefully, you can enjoy a healthy, well-rounded diet with lots of variety. Myth 3: Snacking puts on pounds. Actually, eating small, frequent meals throughout the day will help you control your weight and keep your food cravings under control. The key to healthy snacking is choosing what to eat, how much to eat and how often to eat, so that you’re not grazing all day. Myth 4: Carbs make you fat. It’s the number of calories you eat that can make you fat, not whether they come from carbohydrate, fat or protein. One type of food will not make you gain weight unless you are eating too much of it. 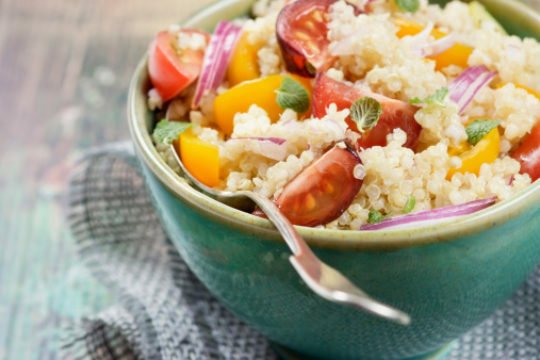 Carbs can actually help you lose weight if you choose whole grain, high-fiber starches. Not only will they fill you up, they will help you feel full longer. Myth 5: Losing weight fast is best. Quick-fix diets may help you lose weight temporarily, but that’s because you’re eating less food than you normally would. However, these diets are usually low in nutrients and are unhealthy in the long run. Thus, they are hard to follow and have little staying power.